The JxJ Council serves as an advisory body, making recommendations to the Director, JxJ staff and EDCJCC Board and supports the department’s financial, programmatic and promotional efforts. The Council plays an integral consultative role, augmenting the capacity of the staff and extending the department’s reach into the community. If you are interested in joining the council, please email Ilya Tovbis at ilyat@edcjcc.org for more information. Learn more about the members of the JxJ Council by clicking on their name below. Sara Cohen is a native Washingtonian and practicing dentist in a 50+ year old D.C. family practice founded by her father and grandfather. Her grandparents were active members of the EDCJCC in its early days. Inspired by the combination of art and science in her work, she believes art and film in particular are the perfect emissaries to give voice to the Jewish experience. She is an active fundraiser for Jewish education and culture, working with the development office of the Charles E. Smith Jewish Day School and the Capital and Endowment Campaign Committee of the DCJCC. She is married to Norm J. Rich, Vice President of the DCJCC and with four grade school children, is doing her best to create Jewish leaders of the future! Michele Berman is a long time board member of the EDCJCC where she has been active with Theater J and former co-chair of its Council, the J’s annual Gala, Nominating Committee and Executive Committee. She also serves as a Vice Chair of the Arena Stage Board of Trustees. She is very excited to be working on this 25th anniversary year of the film festival. Anne Clemons has been a board member of The Jewish Federation of Greater Washington’s Women’s Philanthropy Committee, The Planning and Allocation Committee/Jewish Identity Division, and the Jewish Youth Philanthropy Institute (JYPI). She is a member of AIPAC and Beth Sholom Congregation in Potomac, MD and one the founders of Operation Embrace, a non-profit organization that provides assistance and support to injured survivors of terror in Israel. She is an accountant and business consultant in private practice and lives in Potomac, MD. Dina Gold, a former television journalist with the BBC in London, recently became a US citizen. She now works as a senior editor at “Moment” magazine. Morgan is the managing partner of Verdehouse, which she originally founded by finding underutilized real estate for artists, events and pop-ups in DC. Today, Verdehouse has evolved to offer creative solutions to real estate development challenges. Prior to exploring ways to connect creative and corporate communities, Morgan held diverse roles within architecture and interiors at Gensler, a global architecture and design firm. She is a LEED-accredited professional, on the advisory board for the Dupont Underground Arts Coalition and active with the ADL’s NextGen. Along with a variety of past roles within Young Leadership, Morgan is currently on the Board of Directors for the Jewish Federation of Greater Washington. For the past 25 years, Margie Hoffman has been busy raising two beautiful daughters, now 25 and 22, and taking care of her wonderful husband. During that time span, she has been engaged in volunteer work, with her daughters’ schools and the community. She is currently volunteering as a Montgomery County Bone Builder instructor, where she runs exercise classes for the senior population. She is also a co-chair of Congregation Beth El’s Empty Nester Group. They plan and organize educational and social activities for newly identified congregants who are “Empty Nesters.” She has a very keen interest and passion for the cinema, which dates back to her college years. A favorite past-time of Margie’s is to go to the Cinema Club at the Avalon twice a month on Sunday mornings. For the past 15 years, she has attended the Sundance Film Festival. Last year, for the first time, she went to the Telluride Film Festival. Anita Lampel is a recent transplant from Newport Beach, CA, where she was co-chair of the Orange County International Jewish Film Festival, now in its 28th year. For a decade she had various leadership roles at her synagogue, at the Orange County Museum of Art, and with a local political action committee. She continues as president of TIAS ARMS, a 501 c 3, raising funds for non-profits in South Africa that assist children impacted by the HIV/AIDS epidemic. This year her debut novel was published and she is actively writing and taking courses. A cineaste and ardent book reader, Anita looks forward to working with the Council and putting down more roots in the area. Sid Moskowitz is a retired Trademark Attorney, and presently invests in real estate. He is enamored with the EDCJCC and all it does for the Washington, DC community and the Washington Jewish Film Festival for the great films that it brings to our community throughout the year. A native of Havana, Cuba, Manny spoke Spanish and Yiddish when he arrived in the U.S. at the age of 3. He has forgotten nearly all of the Spanish but, growing up in a Yiddish-speaking home, he developed a love for the mamaloshen and Yiddish culture. Manny retired in 2017 after a 44-year career in journalism, the last 30 of which were spent at Kiplinger’s Personal Finance magazine. Since 1981, he has been a member of Adas Israel, where he regularly leads weekday services, serves as a member of the Budget Committee and has twice chaired the synagogue’s Investment Committee. Subsequent to practicing law, Barbara Silverstein decided to embrace her brain’s right side, designing hats, jewelry, and purses, gardening, writing, reading, and binging on films…her favorite form of entertainment. 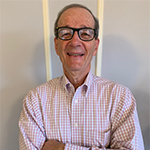 Richard Solloway has worked with nonprofits as a grantmaker, consultant, board member and active volunteer for over 40 years. He is President of Solloway & Associates specializing in strategic planning and grants management with a foci on federal grants and international programs. He is a former Board Member of the EDCJCC. Richard has a particular interest in exploring Jewish culture throughout the world and is excited to bring his interests to WJFF. He is a retired Foreign Service Officer and has lived and travelled extensively outside the US. Diane (pictured on her way to see Avatar) spent her childhood seeing movies at the Capitol, Palace and Columbia theaters on F Street. As a teen, her Saturday afternoons were spent at the Sheridan theater on Georgia Avenue. She saw her first Bergman film (Wild Strawberries) at the Takoma theater. And she still loves going to the movies. Aviva Kempner’s career goal is to make films about under-known Jewish heroes. She produced and conceived Partisans of Vilna, wrote, produced and directed the critically acclaimed Yoo-Hoo, Mrs. Goldberg. Kempner directed, wrote and produced the Emmy nominated and Peabody awarded The Life and Times of Hank Greenberg and its new DVD version. She premiered her latest film, Rosenwald, at the 2015 WJFF and regularly tours the country with it. In 2016, Kemper became a member of the Academy of Motion Picture Arts and Sciences. Miriam Mörsel Nathan co-founded the Washington Jewish Film Festival in 1990 with Founding Director Aviva Kempner. In addition to her work as Festival Director, she served as a Juror for the Mayor’s Award for Films of the Jewish Experience at the Jerusalem International Film Festival and was Co-Curator of the Israeli Film Festival for the Kennedy Center Celebration of Israel’s 50th Anniversary. A poet and visual artist, Miriam’s work has been exhibited throughout the United States and is in private collections both nationally and abroad.